To those that claim that the Women of the Wall are just about “being able to pray how they want, with no further agenda,” the above article in HaAretz should prove instructive. 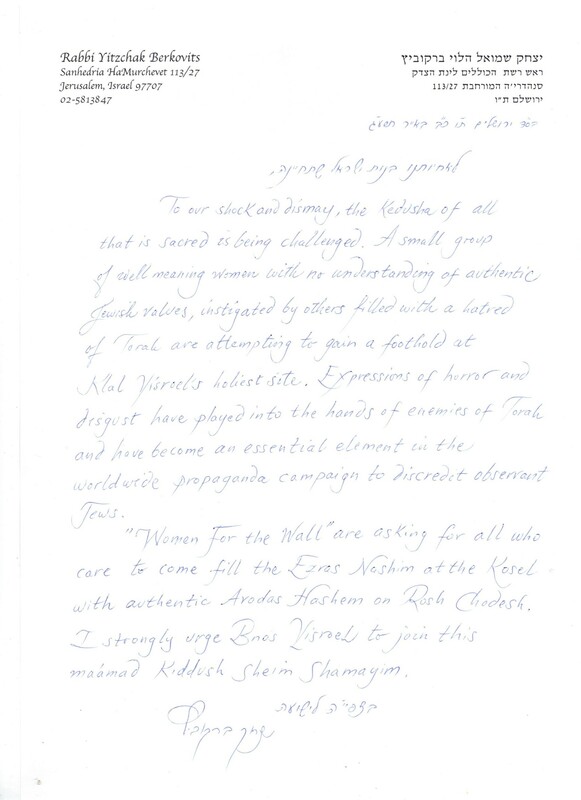 In her open letter in response to Leah Aharoni, co-founder of Women For the Wall, the writer, Reform Rabbi Elianna Yolkut, states quite clearly that the agenda is not just about prayer, at all. Non Orthodox Jews- I understand your pain that the laws in Israel don’t treat Orthodox Judaism and Reform and Conservative Judaism the same. Your struggle is a valid one, but its a political one, not a religious one, because this is about Israeli laws. So please, take your fight to the political arena, to the Knesset and the supreme court, and leave the holy sites out of it. The Kotel simply isn’t the proper venue for a battle of rights. Fighting for this agenda at the Kotel is akin to having a Gay Pride Parade in the Vatican. There is a time and place for everything, and the Kotel simply isn’t the right place to fight your political battles. The Knesset met today on the WoW issue, but intrinsically, any movement which breaks away from another movement is putting itself outside the pale of the original movement. The dust has now settled on my previous article. There were many positive reactions, but also about 10 negative comments, none of which contradicted the basic facts I presented. That implies that these women agree with the illogicality of Anat Hoffman�s behavior and are happy to be used by Anat for her own devious purposes, even though they contradict the basic tenet of the Reform Movement and indeed of plain and simple decency and concern for others. 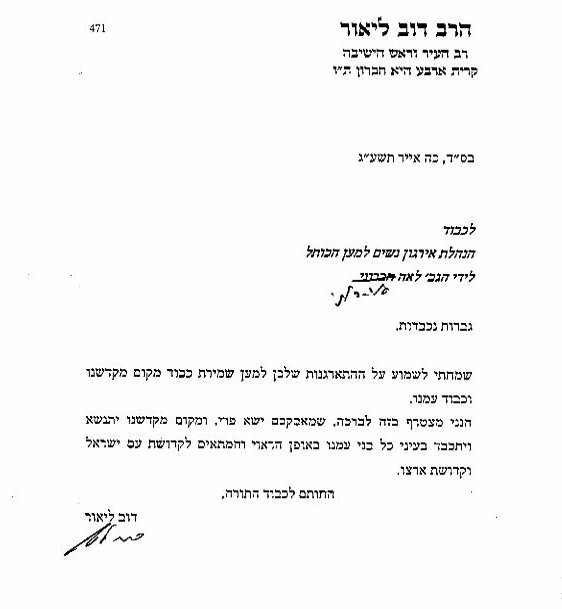 One comment pointed out that Anat Hoffman actually does not, like many of her male co-religionists, wear tefillin at the Kottel � I accept the correction and I apologize. Another commenter protested that I was denying the sincerity of the women praying at the Wall, which I was not. The thrust of the article was to expose the long-term damaging intentions of Anat Hoffman and to appeal to those sincere women that they not allow their sincerity to be used by Anat for her devious purposes, as revealed in her BBC interview. However, more important than these and other issues was that many of the comments illustrated a common fallacy. This fallacy is that someone who does whatever he chooses from what is written in the Torah, how he wants to, when he wants to and if he wants to, is fulfilling what is prescribed by the Torah and thereby can claim to be Jewish and demand equal rights with Orthodox Jews, regardless of his lineage. This is like an American claiming a pension from Britain because he speaks English and dresses the same way as the British do and besides, some of the towns in the USA are named after British towns. Effectively, Anat is doing the equivalent of going into a mosque, refusing to remove her shoes, refusing to bow down at the appointed times, and insisting on praying her own version of the liturgy, loudly, in English. Intrinsically, any movement which breaks away from another movement is putting itself outside the pale of the original movement. Orthodox Jewry understands that the Torah � the Written Torah and the Oral Torah � has been passed from generation to generation as an unbroken chain. It is important to point out the various branches of Orthodox Jewry � Yemenite, Ashkenaz, Sephardi, are simply variations of customs. Their basics remain the same. Even Hassidism, which looks like a breakaway movement, is only a change in focus and remains completely faithful to the Orthodox Torah. There have always been two ways to reach communion with G-d. One way is to study and try to do His Will. The other way is to dedicate one�s actions to Him. The first way is called the �Way of Torah�; the second way is called the �Way of Prophesy�. There were even schools to teach people to become prophets. Of course, the followers of both ways needed to follow some of the other way, but it was a question of which way was dominant. After the cessation of prophesy in the early 2nd Temple period, the second fell into disuse. Due to the oppressions of the Jews during the Middle Ages, the study of Torah became very difficult and the ignorant �man-in-the-street� felt he was unable to connect with G-d and serve him. The genius of the Baal Shem Tov was that he re-vitalized some aspects of the Way of the Prophets to enable the ordinary person to dedicate their everyday actions to G-d. However, this idea attracted even advanced Torah scholars to such an extent that others were afraid that the movement, Hassidism, would detract from the study of Torah and hence their antagonism. One point which came out clearly is that many of the women in the group feel they are enhancing their connection with G-d by �taking on� these mitzvos. They are doing what they want to do � but is that what G-d wants them to do? Nodov and Avihu, the sons of Aharon the High Priest, did what they felt would enhance their service to G-d � and they paid the ultimate price for their mistake because it was not what G-d wanted. G-d is not a mushy, honey-coated sugar-daddy. He states exactly what He wants and anything outside that is not acceptable. Note the details and precision of the requirements of the construction of the Tabernacle, the sacrificial services, laws of Family Purity, civil laws and so many of the other mitzvos. The Reform Movement bases its �religion� on feelings and intellectuality. This is the antithesis of what is written in the Torah. The Wall itself, as a relic of the Holy Temple, is sacred only to those who abide by the full Torah, which includes all aspects of the services and sacrifices which were held there. This begs the question, why should Anat be so concerned with the Wall? From its onset, The Reform Movement rejected everything to do with Israel and the Temple. So why should the Reform Movement and the anti-religious concern themselves with the Wall, if not to disrupt traditions which go back thousands of years? Clearly, the Kotel rightfully belongs to those who uphold the sanctity and significance of the Temple. They are the only sector of society for which The Kotel has practical meaning. So, what should a woman who wants to enhance her connection with G-d do? There have always been righteous women who have gone to the Kotel to pour out their hearts to G-d. But they didn�t go with Tallit and Tefillin � neither did they read from the Torah. In fact, apart from rare exceptions, women have never tried to reach closer to G-d through wearing Tallit and Tefillin and reading from the Torah. They were fulfilled by their own unique forms of expression and the nurturing experiences that only women merit. As some of the responses to the comments pointed out, the Feminist Movement, on this issue and others, is actually a movement trying to make women behave like men. Therefore a woman who sincerely wants to enhance her service to G-d, as a woman, should consult with a real religious authority and accept his guidance.